Despite the fact there are 71 living species of hopping marsupial, the three species of kangaroo and the occassional wallaby get all the lime- light. There are many ways of being a hopping marsupial and arguably the cutest (which is biologically very important) is to be a bettong. Woylies are a kind of bettong. Bettongs were called “rat kangaroos” by the first British colonists in Australia (in 1788), and that name has stuck too. Inevitably this causes inexplicably rat-ist people to wrinkle their nose when you say “I’m working with rat kangaroos”, so us zoologists prefer “bettong”. “Woylie” and “bettong” are anglicised Indigenous names. Woylies are also known as brush-tailed bettongs. I have learnt that when I say “I surveyed woylies” people ask “What’s a woylie?”. I respond “It’s a bettong”. The further puzzlement eventually results in me being forced to say “It’s a rat kangaroo”, at which point the nose-wrinkling takes place. So, what are bettongs? 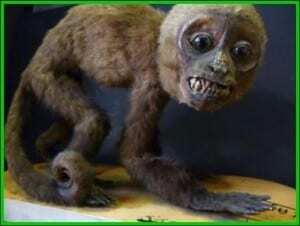 Taxonomically, they belong to the family Potoroidae, along with the potoroos. This family is older than the bigger hoppers, kangaroos and wallabies, and all the members weigh just a couple of kilograms. They have shorter faces and smaller ears (and so are cuter) than kangaroos, and because of their diminuitive body-size their forelimbs appear even tinier, at almost at T. rex proportions. Bettongs retain canines (unlike kangaroos) have blade-like premolars – they are omnivores. Their diet relies heavily on underground fungi. Australia is not a very good place to be a bettong, which is a shame because that’s the only place they are found. 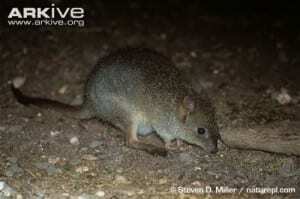 Of the seven hopping marsupials driven to extinction since European settlement, three are from the woylie’s family. The rest have suffered drastic range contractions, mostly as a result of predation by introduced cats and foxes. The Australian Wildlife Conservancy recently calculated that cats alone kill 75 MILLION native animals every night in Australia. And that’s low-balling it. Woylies, once widespread across the southeast, southwest and central-west are now restricted to three small naturally occuring populations in the southwest and a number of reintroduced managed populations. I was visiting one of these, inside a predator-proof exclosure near Perth. They are among a handful of Australian mammals to be ranked as Critically Endangered. One of the two subspecies (B. p. penicillata, from the southeast) is entirely extinct. A number of the reintroduction attempts have failed, even when predators are suppressed or excluded. The reason why is a mystery. Despite their rarity and relative obscurity, woylies represent a whopping 0.007% of the Grant Museum’s collection. Which is to say we have five. Aside from this delightfully mounted skelton, which is posed in the very horizontal position of your average bettong, we have four preserved pouch young at different stages of development. Three of the woylies’ brains have been dissected. 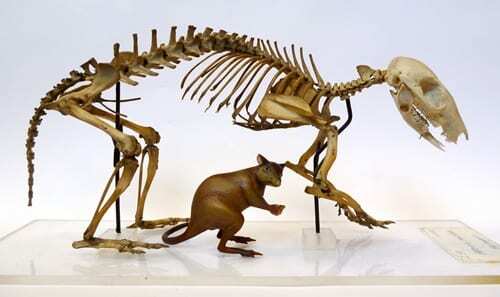 As you can see from the skeleton image at the top, we have a model of this species in the Museum (so technically we have six woylies, or 0.009%). This is one of about 30 one-of-a-kind models we have commission the talented model-maker Tom Payne to produce for us. We have chosen skeletons of species that people may not be familiar with to help them envisage the specimens they see into a whole animal. These models have been slowly trickling into the displays over the past year. The practice of adding models to museum collections is one of the themes that we are exploring in our current exhibition Strange Creatures: The Art of Unknown Animals. 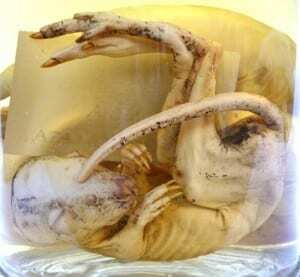 Models have often been used to represent animals that can’t be represented by their own remains, like long extinct partial fossils (think toy dinosaurs), or animals that don’t survive the preservation process (this is the reason our famous Blaschka glass models of invertebrates were produced). Still in 2015 we are continuing this practice with models like this woylie, to help our visitors interpret the collection. Wayne, A., Friend, T., Burbidge, A., Morris, K. & van Weenen, J. 2008. Bettongia penicillata. The IUCN Red List of Threatened Species. Version 2014.3. <www.iucnredlist.org>. Downloaded on 23 April 2015. I was just wondering what the age and measurements of the woylie pouch young specimen is? Apologies this has taken so long to reply – it required a bit of resaarch and a trip to our stores. Based on measurements of crown-rump length (rough measurements from outside the jar), there are two specimens around 75-80 days old (~70mm), one at 90 days (80mm) and one at 50 days (50mm).